Last week, while eating my plain old sandwich in the staff room at work, I noticed another teacher eating a Greek salad that smelled oh, so good! 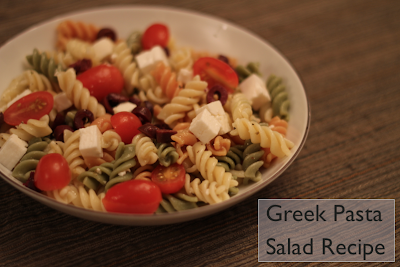 It suddenly gave me a craving for some Greek pasta salad, which I hadn't had in months. So this weekend, I decided to make a huge batch to keep in the fridge for my work lunch this week. I was visiting with my parents in Hamilton over the weekend, since it was my birthday, and decided to shop at the Bulk Barn near their house. The closest Bulk Barn in my neighbourhood is more than twice the distance making this location much more convenient. Before heading into the store, I quickly checked the Bulk Barn Twitter feed to see if they had recently tweeted out a coupon. Unfortunately, the latest coupon had already expired. 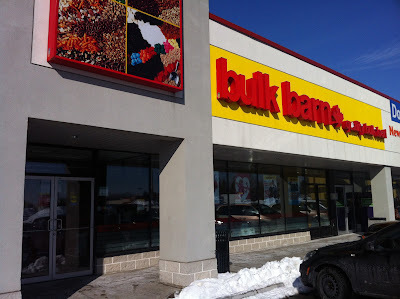 This was my first time at this Bulk Barn location so I had to wander up and down the aisles a couple of times to become familiar with what they had to offer. I was pleasantly surprised to find organic bulk bin items as well as pre-packaged organic foods that my family buys all the time. I found some all-vegetable fusili pasta for my salad and purchased some organic red quinoa and organic black rice which I can use as side dishes for dinner this week as well. I can double the amount of rice or quinoa that I would usually prepare to ensure enough leftovers for the following day. I will be honest, though, that I don't make a habit of planning my meals ahead of time but it is certainly more convenient and cost effective, especially when you make bulk shopping a part of your regular shopping routines. My friend plans her every meal and can account for every penny spent. I only wish I could be so organized. Among the other items that I purchased was a bagful of organic caner sugar, which is a staple in our house. I have never bought it in bulk before but I am excited at the thought of paying less for more. It was easy to find organic bulk bin items since the bins were clearly marked with green labels. I did sneak in a bag of chocolate covered almonds since they were on sale as well as some organic granola bars that I like to have as a snack at work. Once I arrived at home, my husband greeted me with a gorgeous bouquet of flowers for my birthday and offered to help me prepare the Greek pasta salad. Click here for a picture slideshow of my Bulk Barn shopping experience on Google+. Boil the pasta until it's cooked, usually about 8-10 minutes. Drain and let cool. Add cherry tomatoes, feta and kalamata olives. Add the Greek salad dressing and mix until all the ingredients are evenly covered. Cover and refrigerate. My husband likes to make his own dressing. For this Greek dressing, he used extra virgin olive oil with some red wine vinegar and added oregano, minced garlic and salt. It is actually quite tasty! Disclosure: I am a member of the Collective Bias Social Fabric Community. This shop has been compensated as part of a shopper insights study for Collective Bias #CBias #SocialFabric. Any opinions expressed in this post are my own. 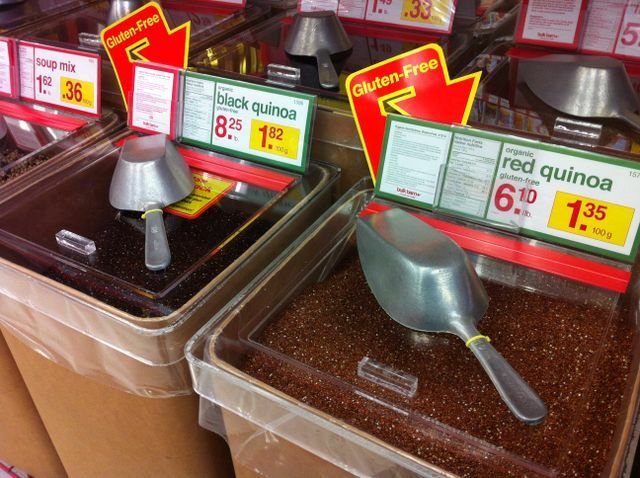 I always buy quinoa at Bulk Barn, the price and varieties are so much better there. And I just happen to have some feta in the fridge right now... this looks like a great way to use it! I think I gained a pound or two just walking down the chocolate/candy aisle! 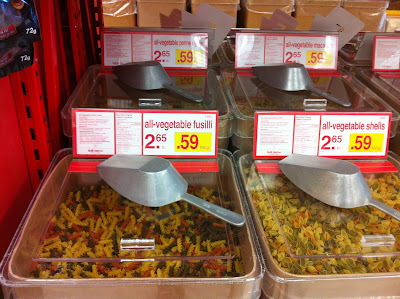 Wow...organic food in bulk! We have nuts and a few candies in bins here but I never see the variety you're talking about. Than again, I might not be looking hard enough. Hmmm...will have to keep an out eye or Google what shops are in my area I might be missing. Happy WW! Oh my gosh! That is one of my favourite recipes!!! Love it! :) Now I'm hungry and I just got back from a Seder dinner!! !